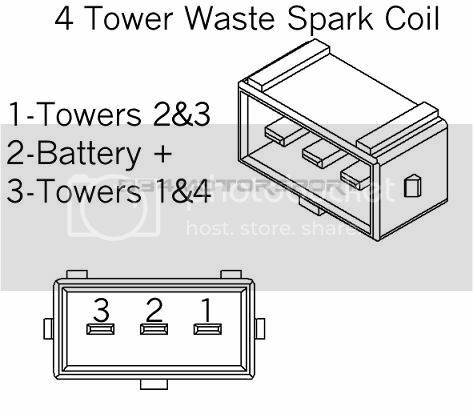 Ok guys, here's a set of instructions for the installation of the wasted spark boards. We're focusing pretty heavily on the installation of the board itself. There are far too many combinations of ignition modules and coils to provide comprehensive instructions on that part of the project. The disclaimer is basically this: Some brain power required, some assembly required, batteries not included. It would be much appreciated if people could post some instructions and impressions relating to the specific parts they used for their installs. Read this entire post thoroughly and completely before posting any questions. The conversion board has been designed to be mounted inside the EZK box. On 240's the EZK box is mounted on the front right corner of the firewall, right above the foot well. On 740's and 940's it is mounted under the dash, above the throttle pedal. Remove the EZK box from the car, and using a torx screwdriver, remove the four screws on the end of the case and the three screws around the connector. This should allow you to open the housing of the EZK box and gain access to the circuit board itself. The conversion board has 8 labeled solder pads. The four pads labeled "5v", "GND", "Out", and "VR" need to be tied to the four labeled points on the EZK board [fig 1]. "VR" goes to pin 7 of the LM2903 IC. If you tin the leg of the IC you can easily attach a wire to it. The "Out" pin is actually intended for pin 16 of the main connector, but we find soldering it to the indicated resistor leg makes for a cleaner installation. If you want to solder your wire directly onto pin 16, feel free to do so. The 5v and GND supply points should be self explanatory. Make sure you don't reverse them. That would be bad. We recommend potting all the wire-to-PCB connections with hot glue to secure the wires from vibration. The two pins labeled 1-4 and 2-3 are the new logic-level spark outputs. They need to come out of the box and go to the proper pins on your power stage/coil. If your car is not equipped with EGR you can piggyback on those pins, or you can just drill a hole in the box to pass the wires through. Using the supplied screw and mounting washer, attach the board to the body of the main EZK connector [fig 1]. Depending on clearance to the housing, it may be necessary to mount the board in an inverted fashion. We recommend the use Bosch Motorsport 2x2 wasted spark ignition coil (part #: 0 221 503 407). This is the only ignition coil we have found with documented dwell characteristics that match the built-in EZK dwell. The stock ignition module has one output stage, but since the wasted spark system requires two outputs you can either install an additional stock ignition module or replace it with a multi-channel equivalent (eg. Bosch 0 227 100 203, Volvo 960). A sample wiring diagram is shown in [fig 2]. It is important to note that these parts are simply suggestions. You are free to use any suitable combination of ignition modules and coils. NOTE: This feature is considered experimental. This means we don't guarantee it will work well, or even at all. It means use at your own risk and we are not liable for any damage caused by its operation. Basically don't be an idiot. Your wasted spark conversion also comes with an experimental hard-cut rev limit/launch control/flat shift feature. In essence it allows you to hold the engine at any rpm, even whilst applying full throttle. This should enable more consistent launches from a standing start. It is important to note that this is not an "anti-lag" function since ignition timing is not being retarded. Recommended wiring diagrams for the arm and set features are shown in [fig 3]. The dash-mounted set switch should ideally be momentary and the clutch switch must close to ground as the clutch is depressed. It is important to note that the launch control feature will be completely disabled by simply not connecting anything to the set and arm pads. Depending on how you have the system wired, there are a couple of different ways to drive the tachometer. The first (and arguably easier) method works if you have left the stock power stage and wiring intact. 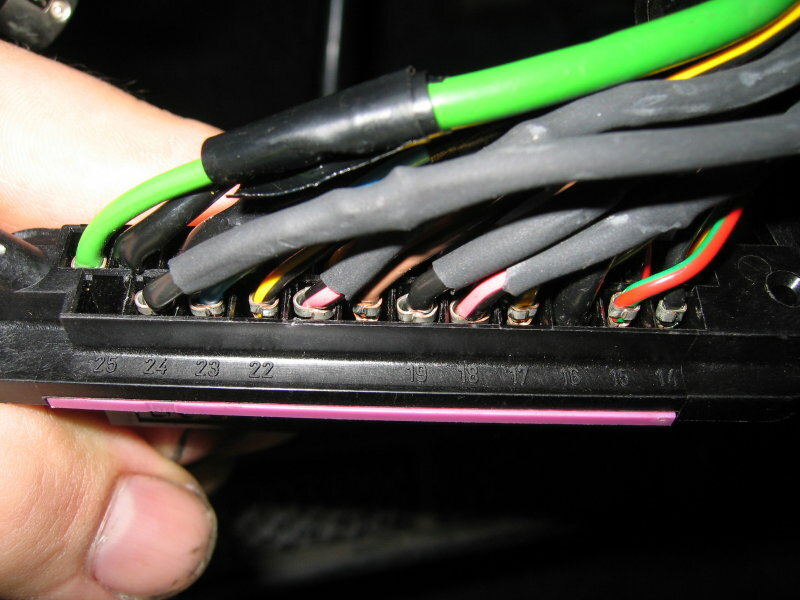 Simply move any wires currently connected to the stock coil's two spade terminals to the "85" and "86" terminals of an automotive relay. To keep the relay from clicking you should open the body of the relay and remove the contactor assembly. If you have chosen to remove or modify the stock wiring, then driving the tachometer can most easily be done by building a circuit similar to the one listed in the MS-Extra manual under "Option for High Voltage tacho" (http://msextra.com/doc/ms1extra/MS_E...l.htm#tachoout). The base of the transistor should be connected to the stock EZK spark output pin. Note that this solution uses the same modified automotive relay as mentioned earlier. Figure 1: Preferred connection points inside the EZK box. Note the multiple 5v and Ground suggestions. Figure 2: Suggested ignition module wiring. Figure 3: Suggested launch control wiring. Last edited by Karl Buchka; 10-28-2011 at 05:26 PM.. Since Im going to use Toyota Cops with built in Ignitors is there going to be issue with dwell there? I'll provide an (un)educated guess and say no, it won't. Yes, that's the one. The stock spark output goes in place of the "MS PCB" in that diagram. Last edited by malloy1; 10-22-2011 at 10:17 AM..
if you leave the stock power stage and wiring all in place this circuit isn't necessary. i have been running a dummy coil in place of the stock coil for my tach signal since the installation of the beta buchka motorsports electronic engineering super happy fun time luxury A+++ wasted spark conversion board. Thanks for posting that Lawrence. I just added a section on tachometer driving. any info on where to source that dummy coil substitute? Read the section I just added. I've been on board with the second test board in operation. I'd like to add my installation notes. Mitsubishi J702T Ignition module, coming off 90-98? mazda miatas (1.6l being the most common). This module works great, and just solder up 1 wire for a full functioning volvo tach. Also the coil packs off same said car work perfectly, I made 300whp on them, 500dollarmatt made 360whp. Last edited by WindowsBreakerG4; 11-02-2011 at 03:51 PM.. I've been led to believe that LS1 coils will work perfectly fine. What dwell do they require? Ok I see people doing it so I guess the miata people ( ) are full of crap I see people running wasted spark with LS coils. A dwell figure of 5.5-6.0ms is advised for LS1 coils. A dwell figure of 5.0-5.5ms is advised for LS2 coils. Sorry I didn't mean to drag this off topic, YMMV. 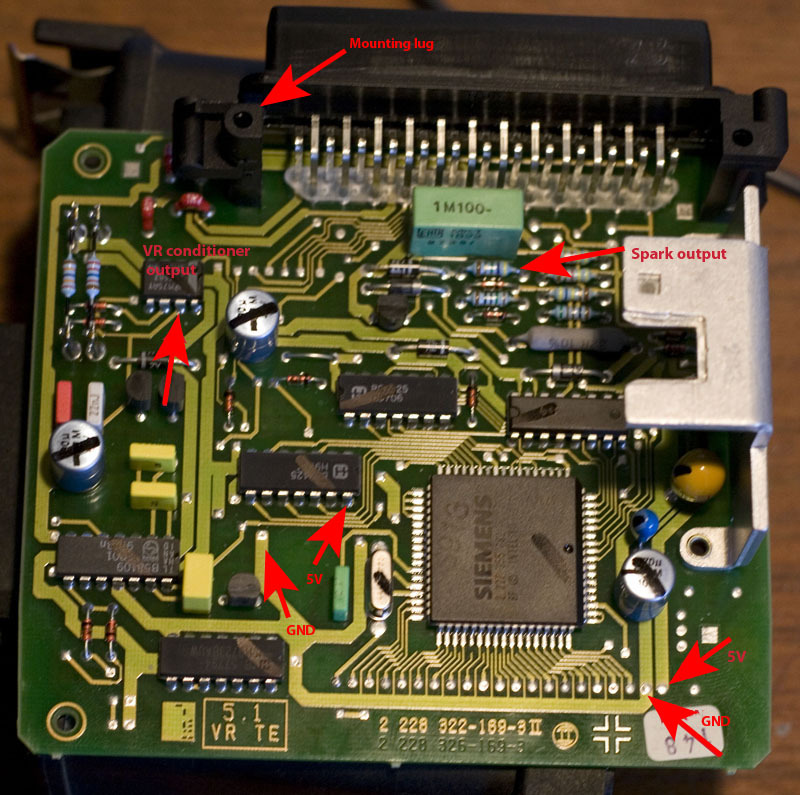 Is there enough dead output pins on the ECU to run the waste spark through the plug instead drilling a hole in the case? As I mentioned in the original post, a non EGR EZK will have enough free pins. Beyond that, I'm not sure. I see no reason to not be able to parallel up the LS1 coils to a mitsu igniter.. split the 12v out each way and have enough to trigger all 4, unless i'm incorrect in my assumption. correct me if I am wrong. bret, wahat wire did you solder the tach output to? did you leave the stock ignighter in place? what post numbers are the egr pins? Looks like 18, 19, 21 and 25 has something to do with timing advance/retard, so those should be not used. That leaves 9 and 24 as empty, but who knows if they don't go anywhere inside the EZK box (the post shows them as grounds)? Three pins are EGR pins (14, 15 and 22), so looks like those three can be used as wasted spark output for non EGR boxes. Last edited by malloy1; 11-02-2011 at 10:52 PM..